Use a ruler to mark the center of the plate. Lay the ruler on the center mark, press down and fold the plate over the ruler. Glue one end from the fold up about 2 inches. Cut the other end at about a 45 degree angle from the fold and up about 2 inches and glue together to form the front of the boat. Cut away the extra plate 2 inches above the fold. Cut a 1 1/2 by 2 inch piece of foam plate and glue to the inside about half way back from the front to hold the sides apart. Cut a straw to a 3 inch length and taper one end down to less than 1/2 the original size. Do this by making an inch long cut and squeezing and taping or glueing. Cut a circle about the size of a dime (5/8 inch) in diameter from a cereal box. Push a sharp pencil thru the center and fit the large diameter end of the straw thru and glue in place. Stretch a 7 or 9 inch baloon over this circle. Glue this assembly on the back of the boat and center so the baloon lays inside the boat. Fill the bottom of the boat with 2 ounces of sand or 25 pennies until the boat floats level. Inflate the balloon and race for speed or distance. Steer the boat by bending the back. 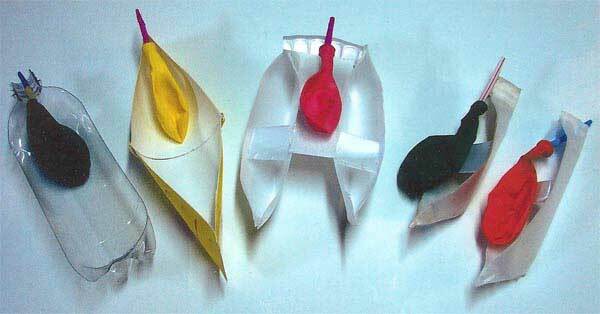 The straw can also be glued so it blows air under the water, Make two boats to see which works best. Do not use in deep water. See the photo for other designs. The twin hull boat is faster because it needs less weight to be stable. 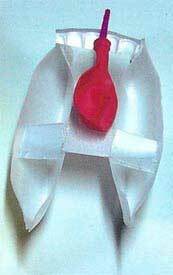 A boat can be made from a paper cup or a 1 or 2 liter soda pop bottle. Have an adult cut the bottle lengthwise in half. Have fun and keep experimenting.